He was diagnosed with Marie Strumpell (sp?) Disease when he was 13, which later became AS. His spine was fused by 19. 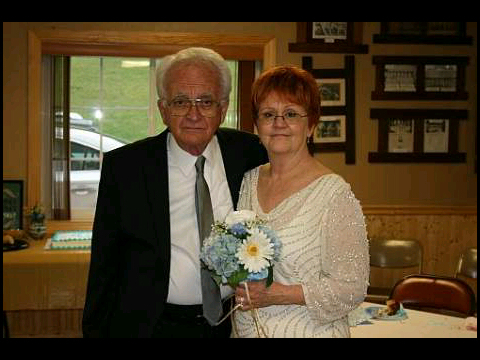 Devon says, This is my grandparents on their 50th anniversary. On a side note HIS mother, my great grandmother was the 2nd person in the united states to have a total hip replacement, and the first for total knees, total elbows, and total shoulders at the Mayo clinic. She had sever rheumatism and suspected AS as well. I say WOW! An AS’er who was fused up at 19…celebrating a 50th wedding. And some people think AS is the end of the world. I wish we would get more AS survivors to share their stories. Bravo! My Dad is an amazing man! He and my Mom own their own country grocery store with a full-time deli and fresh meat/poultry department. My Dad is nearing 70 yrs of age and works 12 hours per day…..STILL!!! I am so proud to be his daughter…..sorry to know that my daughter now has this disease, too. Derek….my Dad would say ‘go for it’ and be who you wanna be, no matter what. He is so inspiring. I think his true symptoms began in his late teens. I can remember being a child and watching him lay in traction, be in so much pain….but still work full-time, dedicated to his job & family. My grandma was (and still is) my hero. I didn’t see her walk until I was 15 yrs old. When she received her “artifical knees” (as we called them then), I was amazed to see her walking with canes!! She was unable to even comb her own hair, so to when she then received her elbow & shoulder—-it seemed miraculous. Wow–what an inspiring story and family you have.